Not to be confused with Epsom. Seiko Epson Corporation (セイコーエプソン株式会社, Seikō Epuson Kabushiki-gaisha) (Epson being an abbreviaiton for "Son of Electronic Printer"), or simply Epson, is a Japanese electronics company and one of the world's largest manufacturers of computer printers, and information and imaging related equipment. Headquartered in Suwa, Nagano, Japan, the company has numerous subsidiaries worldwide and manufactures inkjet, dot matrix and laser printers, scanners, desktop computers, business, multimedia and home theatre projectors, large home theatre televisions, robots and industrial automation equipment, point of sale docket printers and cash registers, laptops, integrated circuits, LCD components and other associated electronic components. It is one of three core companies of the Seiko Group, a name traditionally known for manufacturing Seiko timepieces since its founding. Epson is best known for its "Micro Piezo" piezoelectric printing technology and "3LCD" LCD projection technology. In 1943, Daini Seikosha established a factory in Suwa for manufacturing Seiko watches with Daiwa Kogyo. In 1959, the Suwa Factory of Daini Seikosha was split up and merged into Daiwa Kogyo to form Suwa Seikosha Co., Ltd: the forerunner of the Seiko Epson Corporation. The company has developed many timepiece technologies. In particular, it developed the world's first portable quartz timer (Seiko QC-951) in 1963, the world's first quartz watch (Seiko Quartz Astron 35SQ) in 1969, the first automatic power generating quartz watch (Seiko Auto-Quartz) in 1988 and the Spring Drive watch movement in 1999. In 1961, Suwa Seikosha established a company called Shinshu Seiki Co. as a subsidiary to supply precision parts for Seiko watches. When the Seiko Group was selected to be the official time keeper for the 1964 Summer Olympics in Tokyo, a printing timer was required to time events, and Shinshu Seiki started developing an electronic printer. In September 1968, Shinshu Seiki launched the world's first mini-printer, the EP-101 ("EP" for Electronic Printer,) which was soon incorporated into many calculators. In June 1975, the name Epson was coined into the next generation of printers based on the EP-101 which was released to the public. (EPSON:E-P-SON: SON of Electronic Printer). 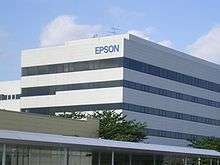 In April of the same year Epson America Inc. was established to sell printers for Shinshu Seiki Co. In June 1978, the TX-80 (TP-80), eighty-column dot-matrix printer was released to the market, and was mainly used as a system printer for the Commodore PET Computer. After two years of further development, an improved model, the MX-80 (MP-80), was launched in October 1980. 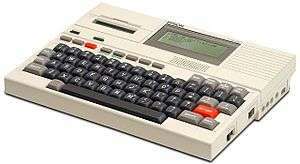 This was soon the best selling printer in the United States. In July 1982, Shinshu Seiki officially named itself the Epson Corporation and launched the world's first handheld computer, HX-20 (HC-20), and in May 1983 the world's first portable color LCD TV was developed and launched by the company. The company developed the Micro Piezo inkjet technology, which used a piezoelectric crystal in each nozzle and did not heat the ink at the print head while spraying the ink onto the page, and released Epson MJ-500 inkjet printer (Epson Stylus 800 cartridge) in March 1993. Shortly after in 1994, Epson released the first high resolution color inkjet printer (720×720 dpi was considered as a high resolution), the Epson Stylus Color (P860A) utilizing the Micro Piezo head technology. Newer models of the Stylus series employed Epson’s special DURABrite ink. They also had two hard drives. The HD 850 and the HD 860 MFM interface. The specifications are reference The WINN L. ROSCH Hardware bible 3rd addition SAMS publishing. In 1994 Epson started outsourcing sales reps to help sell their products in retail stores in the United States. In 1994 Epson started the Epson Weekend Warrior sales program. The purpose of the program was to help improve sales, improve retail sales reps' knowledge of Epson products and to address Epson customer service in a retail environment. Reps were assigned on weekend shift, typically around 12–20 hours a week. Epson started the Weekend Warrior program with TMG Marketing (now Mosaic Sales Solutions), later with Keystone Marketing Inc, then to Mosaic, and now with Campaigners INC. The Mosaic contract expired with Epson on June 24, 2007 and Epson is now represented by Campaigners, Inc. The sales reps of Campaigners, Inc. are not outsourced as Epson hired "rack jobbers" to ensure their retail customers displayed products properly. This frees up their regular sales force to concentrate on profitable sales solutions to VAR's and system integrators, leaving "retail" to reps who did not require sales skills. In June 2003, the company became public following their listing on the 1st section of the Tokyo Stock Exchange. As of 2009, the Hattori family and its related individuals and companies are still major shareholders of Seiko Epson and have the power. Even though Seiko Holdings and Seiko Epson have some common shareholders including the key members of the Hattori family, they are not affiliated. They are managed and operated completely independently. Epson has established its own brand image but rarely uses Seiko. In 2004, Epson introduced their R-D1 digital RangeFinder Camera, which supports Leica M mount and Leica screw mount lenses with an adapter ring. This camera is the first digital rangefinder on the market. Because its sensor is smaller than that of the standard 35 mm film frame, lenses mounted on the R-D1 have the field view 1.53 times as long as that of the standard 35 mm camera. As of 2006 the R-D1 has been replaced by the R-D1s. The R-D1s is less expensive but its hardware is identical. Epson has released a firmware patch to bring the R-D1 up to the full functionality of its successor—the first digital camera manufacturer to make such an upgrade available for free. In fall of 2012, Epson introduced a printer called the Epson Expression Premium XP-800 Small-in-One. It has the ability to print wirelessly. In the summer of 2015 Epson came out with a printer, the Epson ET-4550 which instead of print cartridges, enables the user to pour the ink into separate inkwells from ink bottles. This saves you 90% of the cost of replacement ink over the long run. In the third quarter of 2012, Epson's global market share in the sale of printers, copiers and multifunction devices amounted to 15.20 percent. Epson is also involved in the smart glasses business. Since 2016 the company has three different models. First up was the Epson Moverio BT-100 which was followed up by the Epson Moverio BT-200. In 2016 the company also released the Moverio Pro BT-2000 which is an enterprise oriented, upgraded version of the BT-200 with steroscopic cameras. The company also was the first to release consumer smart glasses with see through optics that made them very popular under drone pilots for being able to get a first person view while still being able to see the drone in the sky. To control its printers, Epson introduced a printer control language, the Epson Standard Code for Printers or (ESC/P), which became a de facto industry standard for controlling print formatting during the era of dot matrix printers; whose popularity was initially started by the Epson MX-80. 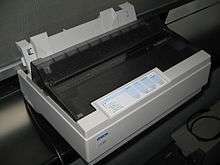 In July 2003, a Dutch consumer association advised its 640,000 members to boycott Epson inkjet printers. The Netherlands-based organisation alleged that Epson customers were unfairly charged for ink they could never use. Later that month, however, the group retracted its call for a nationwide boycott of Epson products and issued a statement conceding that residual ink left in Epson cartridges was necessary for the printers to function properly. Epson designed ink to be left in the cartridges (and in fact they have done so ever since they developed the piezo-electric head) due to the way the capping mechanism worked. If the capping mechanism dries out, then the heads risk getting clogged, and thus an expensive repair will be necessary. The reason that the Dutch consumer association retracted their statement was that, as pointed out, Epson had made a statement regarding how many pages (at usually a 5% coverage of an A4 sheet of paper) each cartridge could sustain for printing. Nonetheless, Epson America, Inc. settled a class action lawsuit brought before the Los Angeles Superior Court. It did not admit guilt, but they agreed to refund $45 to anyone who purchased an Epson inkjet printer after April 8, 1999 (at least $20 of which must be used at Epson's E-Store). According to IDG News Service, Epson filed a complaint with the U.S. International Trade Commission (ITC) in February, 2006, against 24 companies that manufactured, imported, or distributed Epson-compatible ink cartridges for resale in the U.S. On March 30, 2007, ITC judge Paul Luckern issued an initial determination that the ink cartridges in question did infringe upon Epson's patents. The judge also recommended those companies and others to be barred from manufacturing, importing, or reselling Epson cartridges in the U.S., said Epson. In 2015 it emerged that Epson printers reported that cartridges are empty when in fact 20% of their ink remains. 1 2 "Consolidated Results for Year Ended March 31, 2016" (PDF). Retrieved April 29, 2015. ↑ "Head Office & Japanese Facilities." Seiko Epson. Retrieved on January 13, 2009. ↑ "Epson Printers - Unrivaled in Quality". Retrieved 16 August 2015. ↑ Porterfield, Deborah (September 29, 2012). "New products: earphones block noise and take calls". USA Today. Retrieved September 29, 2012. ↑ Print industry crisis Retrieved 17. January 2013. ↑ "Epson Faces Consumer Suits". PC World. 2003-10-24. Retrieved 2009-07-30. ↑ "XO(R) Web Site Hosting". Epsonsettlement.com. Archived from the original on December 14, 2007. Retrieved 2009-07-30. ↑ "Epson wins preliminary ruling against aftermarket cartridge manufacturers". Ars Technica. Retrieved 16 August 2015. Wikimedia Commons has media related to Epson.